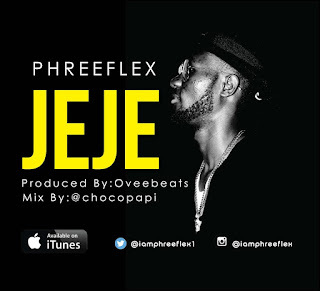 Phreeflex, born Ikhana Godwin, is one of the fastest upcoming artistes in Nigeria today. The Edo state born Afro Pop star started music at a very tender age, and at the age of 17, he recorded his first single. His second track, My Mind, featuring Chisbee and produced by talented producer, Ovabeats, shot him to limelight. He’s performed alongside popular artistes like Jay Aimes, Teeeblack, Addeypipper, to mention but a few. He’s also a professional dancer and an expert DJ. Since releasing My Mind, Phreeflex has been very consistent in doing his thing. He dropped an EP in July 2016 DREAMS (dance round every awesome music & sounds) and now with his latest single titled JEJE produce by oveebeatz, mixed and mastered by chocolatepapi. Enjoy!